Sri Lanka's wildlife sancuaries and parks. During our 16 day guided tour, we’ll circle much of the tear-drop shaped island, visiting the eastern, southern and western shores. We’ve specially designed this itinerary to include not only the “must-see” ancient cultural sites -- Anuradhapura, Polonnaruwa, Sigiriya and Dambulla -- but to explore the charming historic towns and gardens of Kandy and Nuwara Eliya, as well as the natural sanctuaries of the Asian elephants, wild buffalo, crocodiles and other exotic bird- and wildlife. Triconcomalee on Sri Lanka's eastern shore is a haven for scuba diving, snorkeling and whale watching besides being a beautiful coastline. 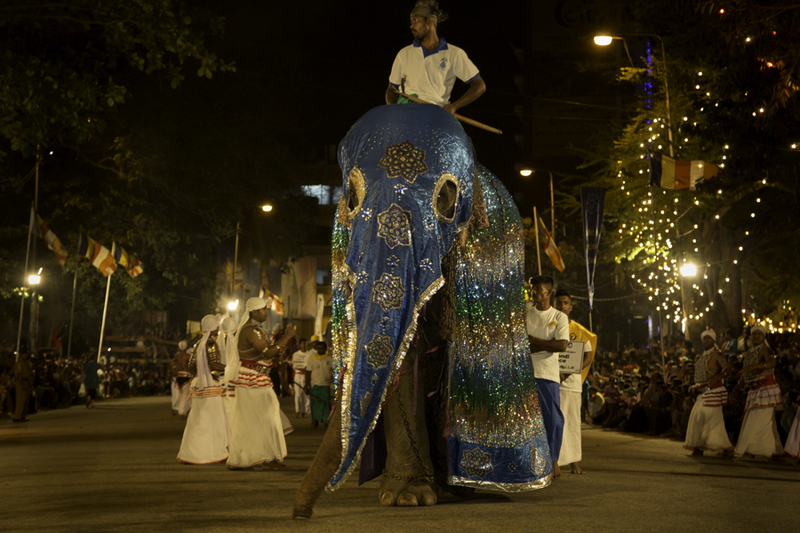 Topping this off, we'll attend the most famous and gala festival of the year, the Nawam Perahera, with hundreds of brightly adorned elephants and dancers, performed in Colombo on the full moon night of February. A minimum of two nights' stay in most locations allows for a leisurely pace, with time to relax and enjoy some of Sri Lanka's finest and architecturally notable hotels. Day 1: Arrive in Negombo: Check in to our hotel and catch up on sleep. In the late morning or afternoon, we’ll take a short city tour of a few notable sites from the Dutch era: a small fort dated to 1678 with a lovely Dutch church of the same date. Overnight in Negombo. Day 2: Anuradhapura: After breakfast, drive to Anuradhapura, the most celebrated of Sri Lanka’s ancient ruined cities, dating to the 2nd century BC. The city’s most renowned relic is the sacred Bo Tree which is said to have grown from a branch of the tree under which the Buddha gained enlightenment. It was planted 2250 years ago and is the oldest historic tree in the world. Overnight in Anuradhapura. Day 3: Visit Mihintale: As a day trip, we'll visit Mihintale -- where a Buddhist monk introduced Buddhism to Sri Lanka in the 3rd century BC -- and the first sanctuary in the world (247 BC) to protect flora and fauna. We'll stretch our legs with a short hike up 1800+ steps alongside local pilgrims: a chance to engage with the friendly Sri Lankans who enjoy a banter and speak excellent English. Return to Anuradhapura. Day 4: Trincomalee: Located on Sri Lanka’s eastern coastline, Trincomalee is one of the largest and safest natural harbors in the world. 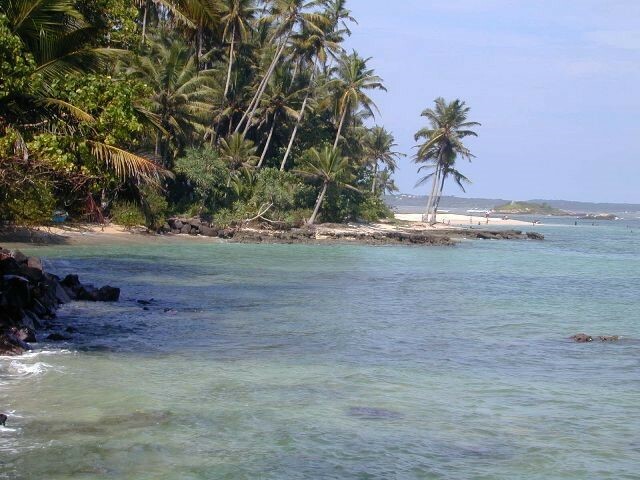 It is also a favorite beach destination, with sunny weather throughout the year, white sands and calm warm waters, ideal for underwater activities and for whale watching. Overnight. Day 5: Trincomalee: Today enjoy a free day to relax at the beach, or arrange for snorkeling or ocean excursions on your own. The lovely beach-side hotel also offers relaxing spa treatments. Overnight in Trincomalee. 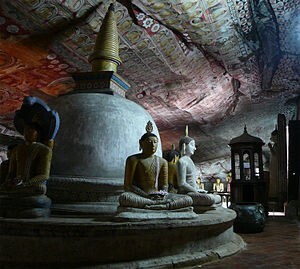 Day 6: Polonnaruwa and Dambulla: Drive two hours to Polonnaruwa, capital of Sri Lanka from the 11th - 13th centuries A.D. It is one of the best planned archaeological relic sites in the country. It, like Anuradhapura, is a UNESCO World Heritage Site. 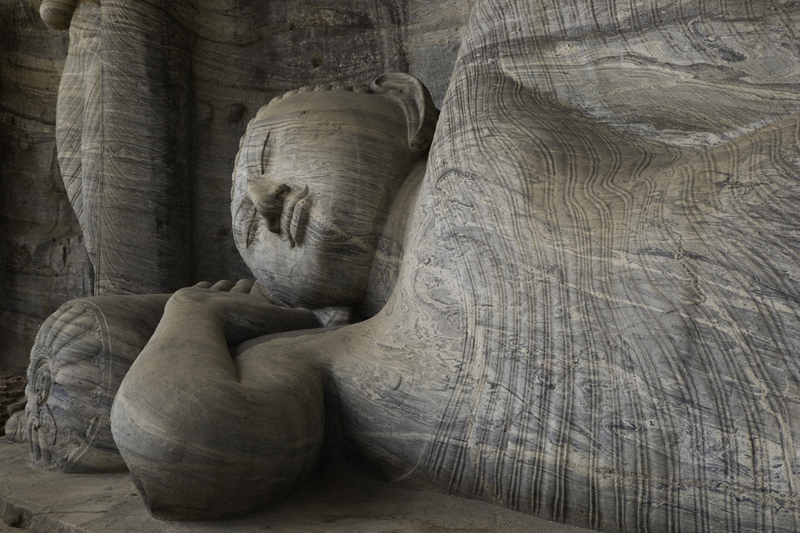 One of the most notable statues is the Reclining Buddha (photo left). Next drive a short distance to Dambulla, where we’ll check in to our hotel and have the chance to visit an astrologer to see where our futures lie. Overnight. 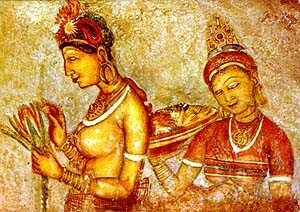 Day 7: Sigiriya and Minneriya: Sigiriya's breathtaking frescoes and unusual landform is hard to forget long after a visit. We’ll climb 500 feet on secure steps and ladders up this steep-sided granite peak known as Sigiriya Rock where a 5th century ruler built a “Fortress in the Sky” as his private enclave, guarded by a lion and the unassailable ascent. Above the stairway cling the delicate frescoes of life sized damsels (photo top left). 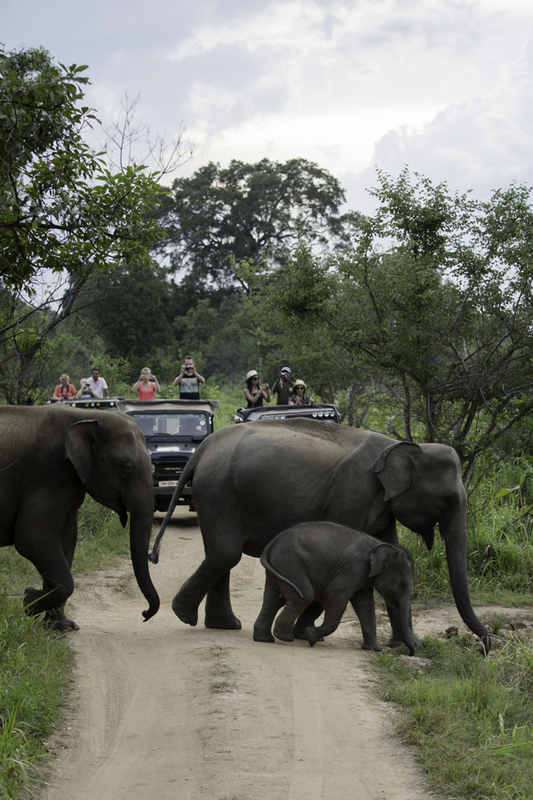 Later in the afternoon, we'll drive to Minneriya National Park for a jeep safari and the chance to see some of the 200 wild elephants, as well as wild buffalo, sloth bear, leopards, crocodiles, 160 species of birds, 78 varieties of butterflies and other wildlife that call this home. We'll return to the hotel to overnight in Dambulla. Day 8: Dambulla Caves, Matale and Kandy: Today we'll visit the impressive Dambulla Cave temples, a vast isolated rock mass 500 feet high and a mile in circumference, dating to the 1st century B.C. There are over 150 life-size statues of the Buddha in various poses. The ceiling is covered with frescoes depicting great events in the life of the Buddha and landmarks in the history of the Sinhalese people. Next, en route to Kandy, we'll visit a spice garden in Matale where cinnamon, cardamom, pepper creepers and other spice trees, plants and creepers are grown. We can attend a cooking demonstration to see how local foods are prepared using these aromic spices (optional). At a batik factory artisans demonstrate how these elaborate batik prints are made -- one of Sri Lanka's most notable art forms. We'll then settle into our hotel in the cool hill station town of Kandy, our home for three nights. Kandy is famous for the Temple of the Sacred Tooth Relic, encasing the Buddha's tooth since the 4th century A.D. -- considered Sri Lanka’s most prized possession. We'll visit here along with other pilgrims and in the evening witness a cultural show featuring various dance types of Sri Lanka. Day 9: Kandy, Pinnawala and Peradeniya: Since 1975, Pinnawala Elephant Orphanage has cared for abandoned, wounded and orphaned elephants. Leaving your heart here, we'll next visit the Royal Botanical Gardens at Peradeniya, 147 acres in size and started in 1374 as a pleasure garden for the kings of Kandy. There are more than 5000 species of trees and plants, some rare and endemics, as well as flora from the tropical world. Overnight in Kandy. Day 11: Train ride through tea plantations to Kuwara Eliya: After breakfast, we'll take a scenic train ride through the lush hills of central Sri Lanka (about 3 hrs). On arrival in the cool hill station of Nuwara Eliya, we'll visit a tea plantation and factory. First planted in Sri Lanka in 1824, tea is a major export and is delicious. We'll overnight in charming Nuwara Eliya, the "Little England" of Sri Lanka, once a popular destination for the British who built country cottages and Queen Ann style mansions here amidst the cool mountain air. Overnight in Nuwara Eliya. Day 12: Nuwara Eliya to Yala: With a stop at the waterfalls at Ella Gap, noted for its view of the Kataragama range of mountains, we'll continue to Yala National Park. In the afternoon, a park naturalist will guide us on a safari tour of the park. Yala is a haven for fauna both indigenous and migratory. There are thousands of flamingoes, spoonbills, cormorants and various species of herons. Pheasants, pea fowl, peacocks and wild fowl are found in the hundreds. Wild buffalo and herds of wild elephants are a common sight. Overnight in Yala. Day 13: Udawalawe: Continuing our exploration of southern Sri Lanka's wildlife sanctuaries, we'll drive less than two hours to Udawalawe and take a jeep safari of the national park. Udawalawe is home to some 500 elephants, wild buffalo, spotted deer, barking deer, wild boar, sambar, hare, mongoose, crocodile and 30 species of snakes, as well as 50 species of butterfly and many species of birds. Overnight in Udawalawe. Day 14: Galle: After breakfast we'll drive 3 hours to Galle and visit its oldest landmark, the massive Portuguese and Dutch Fort, a World Heritage Site inside which the central city resides. The Dutch also installed a sophisticated drainage system, complete with brick-lined underground sewers that were flushed twice a day by high and low tides. The original gate to the fort is still there. Overnight in Galle. Day 15: Colombo and Navam Perahera: En route to Colombo (3 hours), we'll visit a mask factory and museum giving insight into the role of Sri Lanka's elaborate masks in devil dancing, dance dramas and exorcisms. We'll check into our hotel in Colombo, once the capital of Sri Lanka (in 1977 the capital was moved to Sri Jayawardhanapura Kotte, a few miles away). The afternoon is free to explore on your own or rest. In the evening we'll attend the Nawam Perahera festival under the full moon. The pageant hosts hundreds of colorfully decked elephants parading through the streets, along with dancers and musicians sporting elaborate and colorful costumes. Overnight in Colombo. Day 16: Colombo and Depart: After breakfast, we’ll visit Sea Street, the goldsmiths' quarters in the heart of the Pettah bazaar, and elsewhere time permitting. Transfer to the airport and depart Colombo. For an extended holiday in South or Southeast Asia, please inquire about our other trips -- short or long -- to India, Nepal, Thailand, Cambodia, Burma/Myanmar, Laos, Vietnam and beyond.